What are the Information Sciences? Special thanks to our faculty research advisors for mentoring the 2012 i3 Scholars through their year-long team research projects. i3 Faculty Research Advisors volunteered their time to advise a team of students over the course of a year, providing feedback and insights about the project. Each of these dedicated professionals has played a key part in the continued growth and development of i3, from delivering interactive workshops as guest lecturers to serving on program working committees. Most recently, with the help of their Faculty Research Advisors, four teams from the 2012 cohort successfully submitted their research posters to the upcoming iConference. On behalf of all the i3 Scholars, we thank you for your tireless support and dedication. Fall 2013 marks a momentous occasion as 9 i3 Scholars from the 2011 and 2012 cohorts begin their graduate degrees at information schools across the country. The students join two other i3 alums--Ms. Toni Pizza and Ms. Marcia McIntosh--who have already completed their first year of graduate study with great success. i3 Scholars entering graduate school this fall come from a diverse selection of colleges and majors and bring a unique and valued perspective to the information sciences. Congratulations to these amazing i3 Scholars on their current and future success as information leaders. 2011 i3 Scholar, Twanna Hodge, seems to be making quite a name for herself in the information sciences. She recently completed a summer internship at the National Museum of American History. She is also set to begin her graduate studies at the University of Washington iSchool this fall, pursuing a Masters of Library and Information Science. Twanna has been all smiles lately, with good cause. Upon completing her undergraduate degree at the University of the Virgin Islands, Twanna began searching for internships that would provide experience for her future career as a librarian and archivist. Through her network of mentors she came across an opportunity that seemed too good to be true: a summer in Washington, DC working for the Smithsonian. The catch? She had to apply during an overly hectic senior year where she had a few other items on her to-do list: applying to graduate programs, working multiple part-time jobs on campus, searching and applying for financial aid, securing letters of recommendation, finishing strong in those pesky undergrad classes, and every once in a while, if lucky, enjoying some social time with her friends and family. Nevertheless, from the look on Twanna's face in her blog post reflecting on the experience, that hectic and stressful senior year seems to be a distant memory. To learn more about Twanna and her summer internship experience, click here. The Andrew W. Mellon Foundation has renewed its support of the iSchool Inclusion Institute (i3) by awarding the University of Pittsburgh's School of Information Sciences a three year grant of $819,000. The renewed support provides i3 with funding through 2016. This is the third grant from the Andrew W. Mellon Foundation to support the development and hosting of i3, bringing the total donation to more than $1.5 million. As part of the program's continued growth and development, annual cohort sizes will increase from 20 to 25 students per year. This change reflects the increasing number of student applications to i3 as well as the positive support received from US-based iSchools. Several iSchools now offer scholarship funds to graduate applicants who have successfully completed the i3 program. To further expand on its curricular offerings, i3 will host four PhD student Teaching Fellows during its summer institutes. i3 Teaching Fellows will engage i3 Scholars in a series of instructional workshops on research design, programming, and other necessary skills in the information professions. Read more about the Andrew W. Mellon Foundation's renewed support of i3 here. 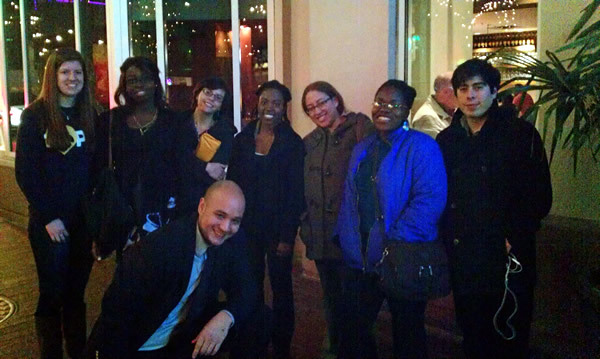 Nine i3 Scholars attended iConference 2013 in Fort Worth, Texas in February. The conference was hosted by the University of North Texas, College of Information and was the eighth annual gathering of information researchers and practitioners. 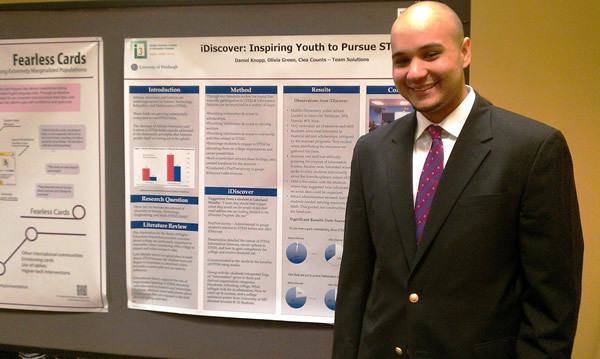 i3 Scholars attended workshops, paper sessions, alternative events, the Social Media Expo, and poster presentations. 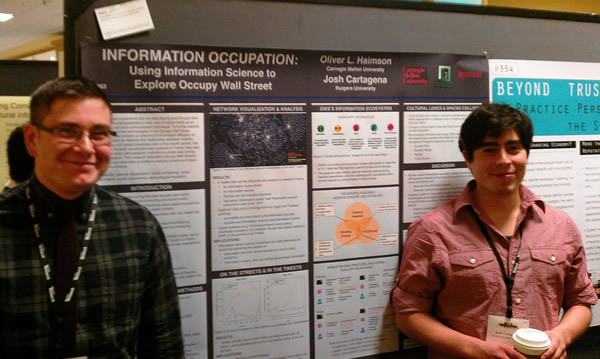 Three 2011 i3 Scholars--Joshua Cartagena, Oliver Haimson, and Daniel Knopp--presented research posters on behalf of their teams. 2012 i3 Scholars met to discuss and refine their ongoing research projects. i3 Scholars also joined Director Michael Depew and Assistant Director Courtney Loder for the annual reunion dinner. The iConference series is presented by the iSchools Consortium and is hosted each year by a different iSchool. For more information about the iSchools and iConference, please see: www.ischools.org. With tank-tread legs and a camera for a head, a remote-controlled robot skitters toward a cardboard box in the center of a classroom in the Information Sciences building. Like a cat arching its back, the robot rises on its front legs and steadily climbs over the box. "It can get over almost anything," explains its operator, Pitt graduate student Steven Nunnally, as the machine's gears buzz and whir.